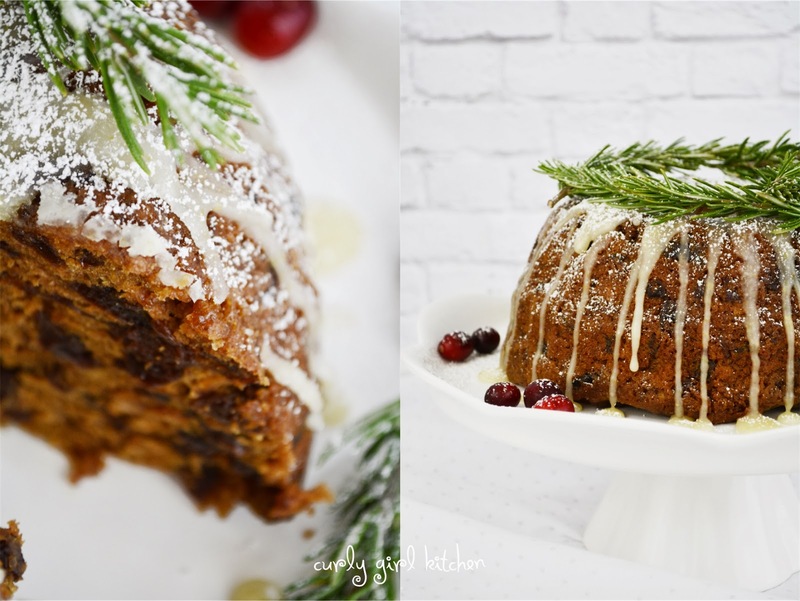 I've always wondered about figgy pudding and determined that this would be the winter I would make one. 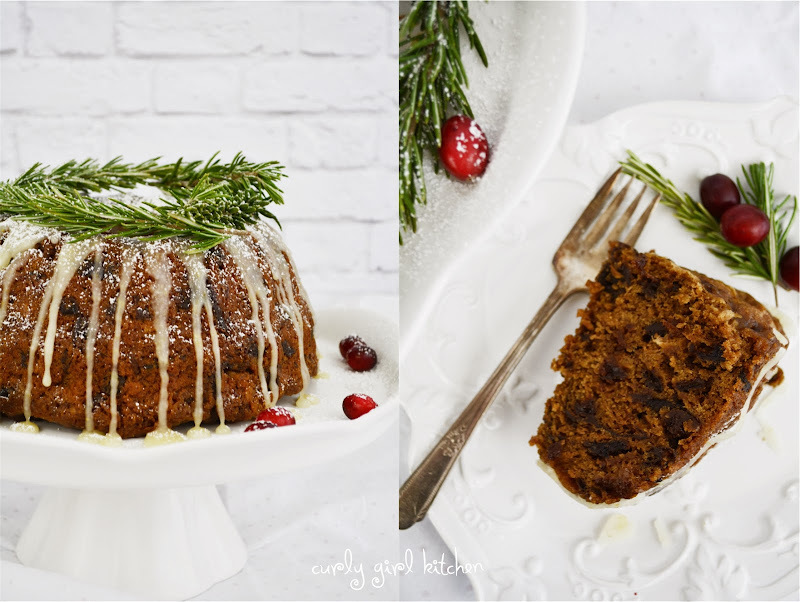 Quite simply, it's a traditional English dessert, similar to a plum pudding, which really isn't a pudding in the way we think of cornstarch-thickened custardy puddings, but a cake that can be baked or steamed. I chose to steam mine, which seemed to be the most authentic preparation. After looking at a few recipes, I settled on one by Dorie Greenspan as the best place to start, although unable to find any figs, I made mine with prunes and raisins, as well as a generous dose of Grand Marnier and Cognac. After soaking the fruit in the liquor, I (well, actually Jamie) lit it on fire to burn off the alcohol, just leaving behind the caramelized flavor. Once the pudding was steamed (my canning stock pot was perfect for this task since it's so huge), I turned it out onto a plate and drizzled it with a tart lemon glaze, which I thought would nicely balance the richness and sweetness of the pudding. 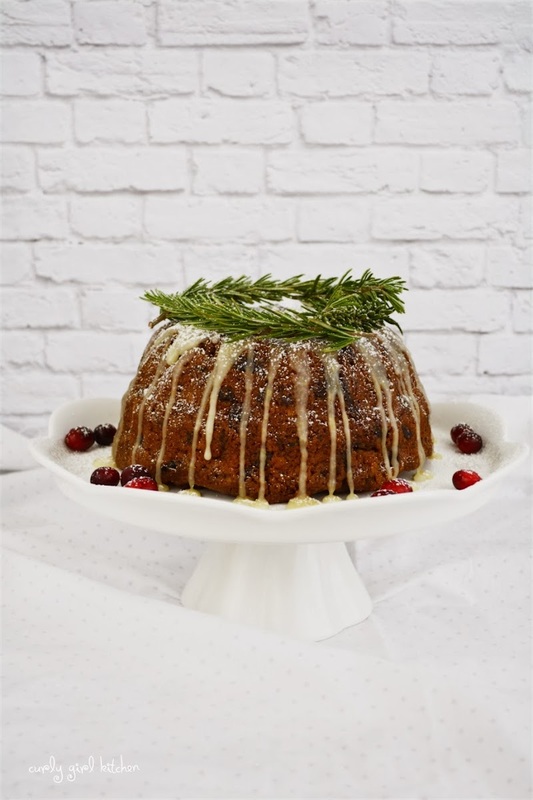 Traditionally, the pudding can also be drizzled with even more liquor, and then set on fire for a dramatic presentation. 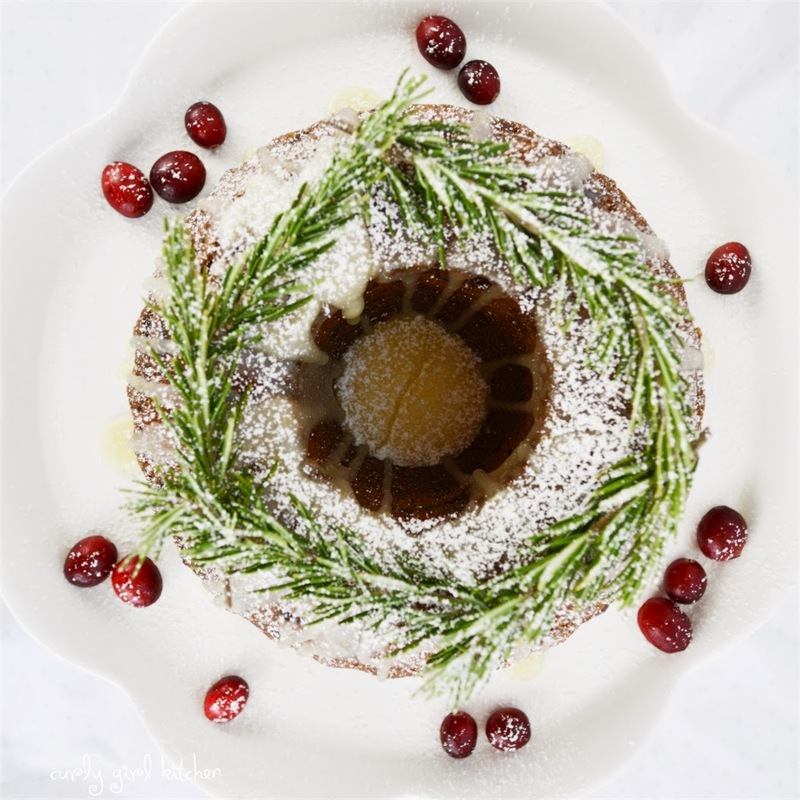 But I garnished mine prettily with sprigs of rosemary, cranberries and a dusting of powdered sugar, like snow on a Christmas wreath. As I was making this, I thought of Harry Potter, when Luna Lovegood says distractedly on her way to dinner, "Hungry. 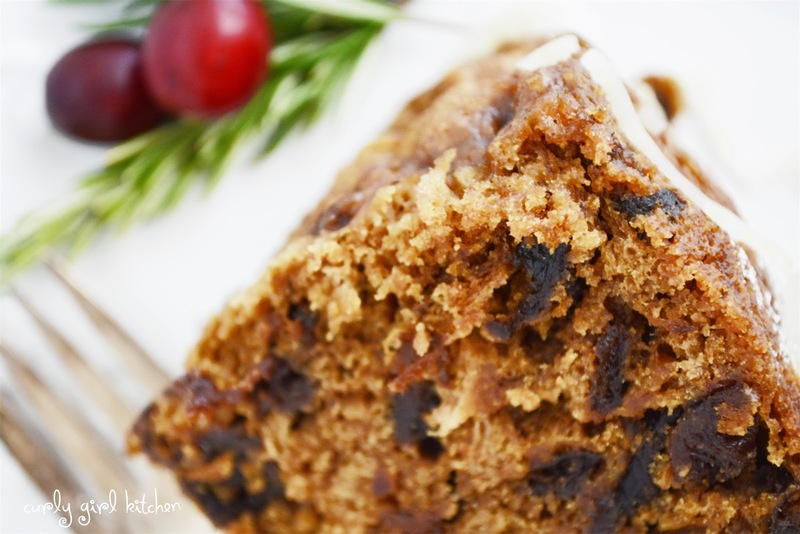 I hope there's pudding..."
The pudding/cake is so incredibly moist from its steam bath, and I loved the plump raisins and prunes throughout, the flavor from the liquor and all the warm spices of cinnamon, nutmeg, ginger and cloves. 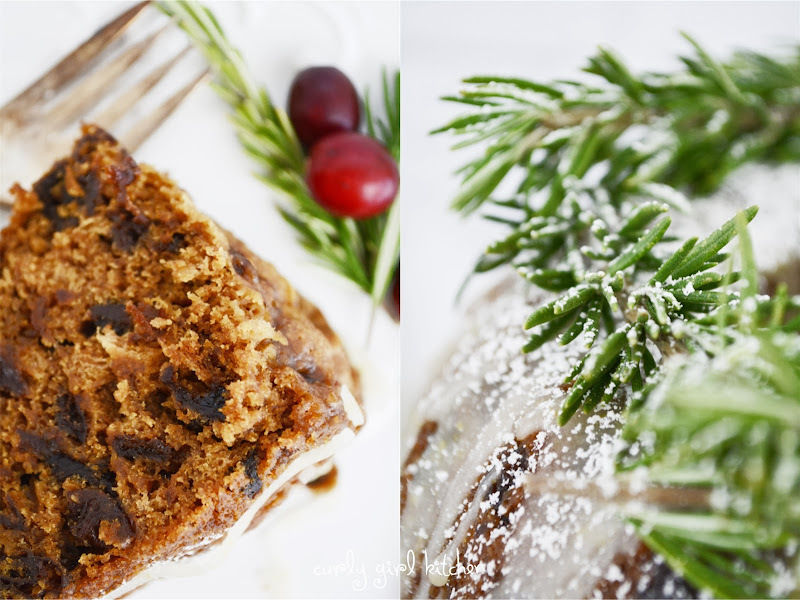 It was a wonderful dessert to end the holiday season. Grease the bundt pan thoroughly with butter or non-stick spray. In a saucepan, combine the prunes, raisins and water; bring to a boil. Reduce the heat to a simmer and simmer just until the water is almost evaporated, being carefully not to let it boil dry and burn the fruit. Add the Grand Marnier and Cognac and bring back to a boil. Remove pan from the heat, and carefully (in an open space) light the liquid on fire; let the flames burn out. In a bowl, whisk together the flour, baking powder, cinnamon, ginger, nutmeg, cloves and salt. In a separate large bowl, whisk together the eggs, brown sugar and molasses until smooth. Using a spatula, stir in the bread crumbs, melted butter, vanilla and fig/raisin/alcohol mixture. Stir in the dry ingredients until moistened. Scrape the batter into the prepared pan and seal the pan tightly with aluminum foil. Set the pan into the stock pot and fill the pot with enough hot water to come one-half to two-thirds of the way up the sides of the baking pan. Set the pot on the stove; bring the water to a boil, then cover the pot tightly with foil and the lid. Reduce the heat to medium low so that the water simmers gently, and steam the pudding for 1 1/2 hours; if the water gets too low, add more hot water. 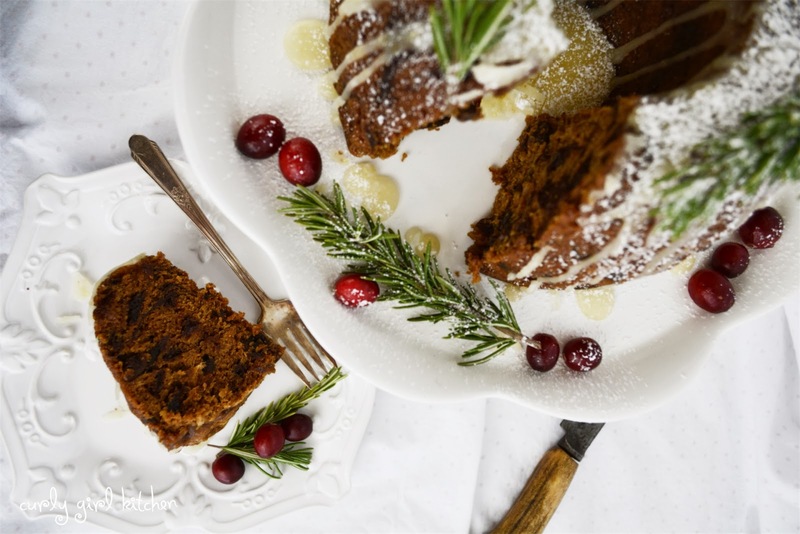 To check if the pudding is done, carefully remove the foil, wearing oven mitts to protect your hands from steam; insert a skewer into the center of the pudding – it should come out clean. To remove the pudding from the pot, use rubber oven mitts to carefully grasp the pan and lift it out of the water. Cool for 30 minutes on a wire rack, then invert onto a serving plate. To make the lemon glaze, combine the lemon zest, juice and granulated sugar in a small sauce pan. Over medium/medium-low heat, bring to a boil, swirling occasionally to dissolve the sugar. Keep the saucepan on the heat and whisk in the powdered sugar until smooth. The glaze will begin to crust as soon as you remove it from the heat, so work quickly; if it’s too thick, add a few drops of hot water. Immediately pour the glaze over the hot cake; glaze will set in about 5 minutes. 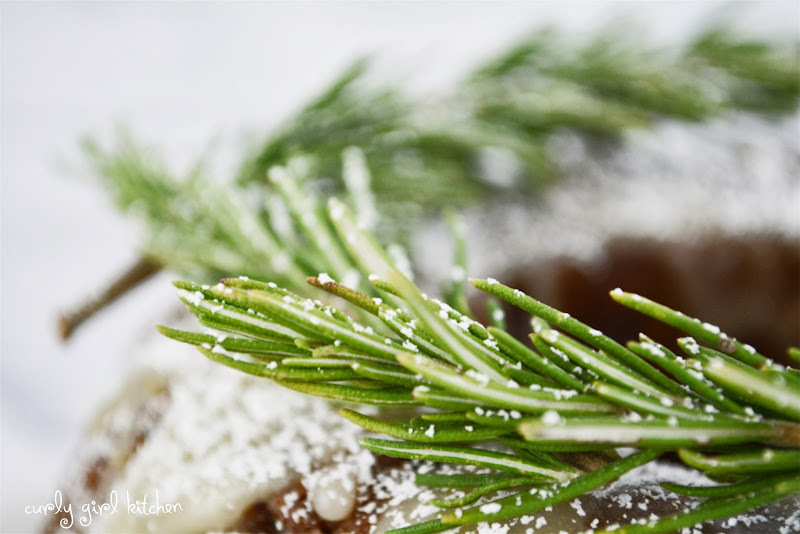 If you like, dust with powdered sugar, sprigs of rosemary and cranberries. Serve pudding warm, with softly whipped cream or ice cream.